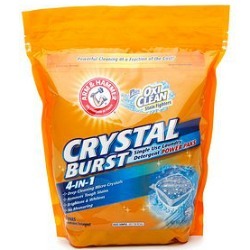 Janel has shared her Arm & Hammer Power Paks Detergent review, in the Crystal Burst variety, which contains Oxiclean. I am using these Power Paks because they were on sale and I had a coupon. First, my family and I have no problem with detergent having a "scent" to it. The pros...quite convenient to use. The cons...I usually put less detergent than what it calls for, and you can't do that with the paks. Somehow I just don't think that it would dissolve fully by just dropping it in, so I put the pak in a measuring cup and run the hot water on it until it dissolves...you probably don't have to do this. I like the smell of the clothes after they are washed and the detergent works fine for us...although my kids are now 25, 23 and 12 so I don't have a lot of stains anymore. I probably will only buy this product if it goes on sale or if I have a coupon because you usually pay more for convenience items and having the detergent measured out for you already is convenient in my book. I hope they do come out with a free & clear version. Thanks so much for your Arm & Hammer Power Paks detergent review. It seems the newest type of detergent available, along with liquid, and powder, are these little laundry detergent pacs. There are also other varieties of this brand which contain Oxiclean besides the Crystal Burst variety. You can read additional Arm & Hammer Plus Oxiclean detergent reviews here. I'd love to hear from even more people who've tried these power paks, sharing how they've worked for them. They also have another variety, called "Toss 'N Done," that don't have Oxiclean within them. You can share your review here, for any variety, telling me what you like, or don't, about it. In addition, you can read other reviews of this brand which have already been submitted. I bought these to try a lower cost alternative to Tide and Tide packs. I've used the regular Arm and Hammer liquid, probably a bottle or two in the past. I washed a load of my work clothes and towels initially in it, along with other various casual clothes. On day one of wearing laundered clothes from the Crystal packs I noticed an itch around my eyes on my face. Day two I woke up with some redness around the forehead. By the end of the day my face and neck were red and itchy. Looked like I had minor windburn from skiing. Small bumps starting to appear. Face starting to feel warm. By day three I already anticipated a trip to the doctor. My face was bright red, looked similar to hives on my face and neck, I also broke out on my right bicep as well as a smaller localized patch on my left bicep area. Face was now puffy as well, very itchy. I started trying to figure out what the cause was. I ate nothing different or new, so not a food allergy. I wasn't in contact with any poison ivy or even around any type of wooded area where that sort of thing thrives. There was nothing else other than the packs that could have caused it other than some minor bug bites, which I've never had a reaction to before ever. The first clinic I went to didn't even want to mess with it, they promptly referred me to an urgent care clinic and insisted I was going to need a steroid shot immediately, mainly due to concerns it was around my eyes. The nurse practitioner commented that it could have very well been a reaction to the baking soda, or just the detergent in general. Later at the urgent care clinic, the nurse who first admitted me made a good point. She noted I washed my bath towels in it and patted my face dry with it. Whenever I dry off with a towel after a shower I always pat my face off thoroughly and then both arms and then the rest. So the freshly laundered towel could have been the initial irritant. The doctor I saw ended up diagnosing it as contact dermatitis. So there you go, there's really nothing else plausible, to me, that could have triggered this. Currently I'm on day two of an oral and topical steroid treatment. Still itchy, still red and really wishing I never bought this stuff. Hope the treatment works, and back with Tide I go. Justin, I'm sorry this happened to you, sounds awful, and I hope you feel better soon. Definitely has the classic symptoms of an allergic reaction to laundry detergent. Lots of people have shared their stories and pictures of allergic reactions from laundry supplies. If you've had a similar experience, you can tell me about it at the link. I have used Arm & Hammer detergent for several years and we have never had a problem until this past weekend. I decided to use the power paks to save space and to see if it was just as good as the liquid. My husband is highly allergic to Tide so we use the Arm & Hammer. Well, I ended up with three out of five of us with a severe allergic reaction to the product. My husband, daughter and youngest son all have a rash (red, raised, swollen, itchy, burns) and it is continuing to spread. It is like they rolled in poison ivy. I called the company yesterday after starting the rewash of everything with our normal Arm & Hammer liquid detergent to let them know of the reaction to the power paks. I have been giving them all Benedryl and Benedryl spray and it continues to spread. It is now day 3 and I need to take my youngest to the doctor because it is the worst on him. They are thinking he and the other two will need a steroid creme. This has been a nightmare. I missed work yesterday and the kids missed school. If you have any sensitivity to any detergents .... DO NOT USE the power paks. Angela, I am so sorry to hear about your family's reaction to this product, and I hope you all feel better very soon. I would be interested to hear if others have had such an allergic reaction. I have been noticing that lots of people are reporting allergies when oxygen bleach of some variety, such as Oxiclean, Oxi Boost, etc., is added to a product. I am not sure it is coincidence or not, but it is something to note, for sure. You can share your own experiences and reviews of this product here, or read even more reviews already submitted for this brand. I had a severe reaction to this product. It's been 2 months and I'm still recovering from the red itchy bumps all over my body. Unfortunately, it took a month to figure out what it was, by then I had used it to wash everything. I have now rewashed my clothes, sheets and towels. I can tell which ones I missed because it feels like there are shards of glass in them. I got a 21 pack of these on sale with a coupon and they came out to $1. I don't normally use the packs because we don't really stain things much and just want to get normally worn clothes clean, but it couldn't be beat for $1. Clothes come out smelling fresh and nice but not overpoweringly scented. Which is great my clothes I only like light scents but for my blankets I'll stick with Gain, I love snuggling up with a heavily scented blanket, it makes me sleep like a baby. I loved the convenience of the power paks. No measuring, no spills, quick and fresh smelling, but arm & hammer insulted our intelligence by changing the wording! And the power paks are noticeably smaller so now I use twice as much! I have been a loyal customer of Arm & Hammer products for years so I notice the slightest differences! Too bad everything we buy now a days are a lot less product or ingredients but definitely cost the same or more. I guess this is the world we live in, what a shame!